Wow, that was a serious blogging lull. My last post was on February 2nd. Coincidentally, I started a new job on February 8th. Between it, baby prep, and numerous other winter projects, my free time has been lacking. However, I'm hoping to turn a corner and get back to regular blog posts. This blog actually isn't mine at all, it is a review from friend and Kayak Angler Magazine digital content manager Ben Duchesney. He had a chance to recently review the Pflueger Patriarch XT. In my opinion, Pflueger spinning reels don't get enough love from the fishing industry. However, rarely I have encountered folks who try and Pflueger and go back to another brand. All of my trout reels are Pfluegers and I love them. They are workhorses, but still smooth as silk. Anyway, here is a snippet of what Ben had to say about the Patriarch XT. 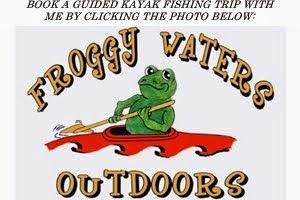 The rest of his review can be found on the Kayak Angler Magazine website. "Lightweight, riddled with high end carbon fiber, titanium and magnesium components and pretty enough to be on a poster up on your wall. I'm talking about some supercar, this is the Pflueger Patriarch XT, $249.95. Everwhere I turned anglers (and Pflueger) were saying this reel is one of the lightest spinning reels around. I wouldn't want to show you guys a reel just because of its light weight though. The Pflueger Patriarch XT is also designed to be smooth. Though when I say smooth, I really mean smooooooth, (in a Rico Suave voice)." Now, if winter would just give up so that I can go fishing! Tight lines!